Many netizens were alarmed this week after watching video clips of a toddler taking puffs from a lit cigar. 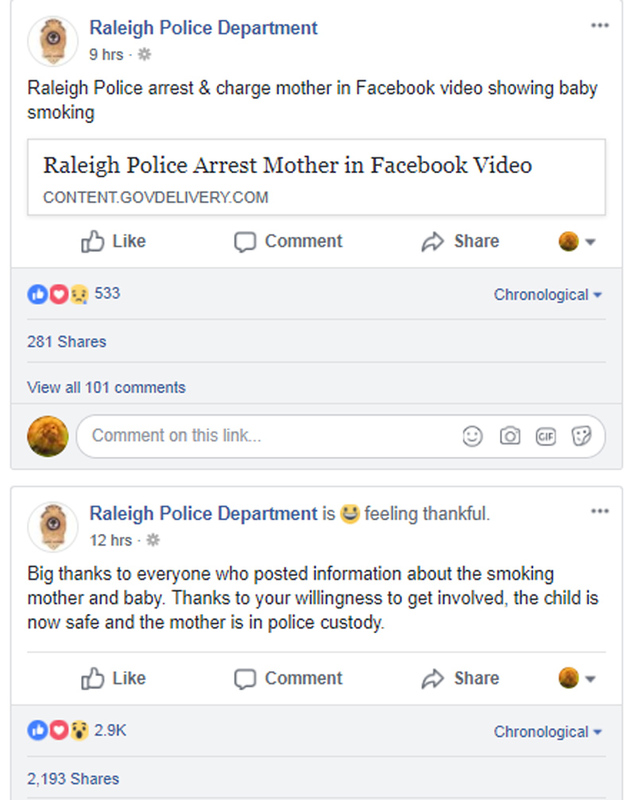 They alerted the police via Facebook on Wednesday (March 21), with a woman writing: "Can you arrest the girl that is making her BABY smoke weed? Something needs to be done about that. Like now." The clip, which has received more than 1.5 million views, shows a child smoking what appears to be a cigarello. The mother has since been identified and arrested. The information supplied led to the prompt arrest of a young mother who lives in North Carolina, the Raleigh police department said. Brianna Ashanti Lofton, 20, has been charged with two counts of felony child abuse and possession of marijuana. However, it is unclear if the substance child had been smoking in the video clips was marijuana. Her toddler is now under the care of child protection services, police said.